Feel Safer Post-9/11? Feel $92B Safer? Earlier this week, the non-partisan (but left-leaning) Rideau Institute released a report on Canada’s defence spending since 9/11 entitled The Cost of 9/11 and the Creation of a National Security Establishment. It was written by economist David Macdonald, and it calculated that $92B ($69B adjusted for inflation) has been spent on ‘security’ in various forms in Canada since September 11, 2011. $9.2B per year to, supposedly, make Canadians feel safer in the wake of the worst foreign terrorist attack to occur on North American soil. But do Canadians feel safer in the decade after 9/11? According to a recent online poll of over 500 respondents conducted by the CBC, over 74% claimed that no, in fact, they do not feel safer after 9/11. But I wonder how many of those who do not feel safer since 9/11 felt safe before the terrorist attack? What’s more, is there any way they could possibly feel safe? Is there is any achievable outcome in the global war on extremism and terror that could satisfy any of the 74% who feel unsafe in Canada. Military expenditures have nearly doubled (+90%) since 9/11 (48% inflation-adjusted), and the Department of National Defence is by far the largest consumer of national security expenditures. Macdonald argues that “these increases in resources for the defence, international, security and justice areas of the federal government has [fostered] the creation of a ‘national security establishment. '” But much has changed in the decade since 9/11, Macdonald writes, and while circumstances are far different now (President Bush is out of office; Al Qaeda has been significantly diminished; Afghans and Canadians grow weary of the war; and Bin Laden is dead), it appears as if spending has not been reduced to reflect the world of 2011. Canada appears to be fighting the 2002 version of the global war on terror well past its best before date. And now the debate has inevitably begun as to what Canadians have to show for such a massive public investment in something as abstract as ‘security.’ And looking to the future, we must begin to discuss whether the global economic instability that has characterized the past three years can justify the continuation of such spending. Because as provinces and municipalities right across the country contemplate service cuts to fight deficits, it should be asked what this investment is worth to the average Canadian. Is security spending worth more to the average Canadian than investments in health care? What about infrastructure like public transit? How about spending on air quality, alternative energy, or the environment more broadly? These areas offer more tangible and everyday benefits for Canadians than any long-term investment in CSIS (Canadian Security Intelligence Service) would, to take one example. The common justification for this type of defence spending seems to go like this: Canadians didn’t want to invest such large amounts of money in keeping ourselves safe – but as the fight has come to North America, we must protect ourselves. And as Chuck Strahl, a former Conservative cabinet minister argued on Power & Politics with Evan Solomon, we may begrudge every dollar we spend on security, but are grateful for the investment when something goes wrong. Defence spending, when seen in this light, is little more than an insurance policy a nation takes out against future catastrophe. This vaguely Orwellian term should be troubling to Canadians, not only for the comparison it strikes in mind with the term ‘Homeland Security’ in the United States, but for the way in which security spending has become so normalized and banal. We are not protecting ourselves from the possibility of being murdered by religious extremists (of any denomination) so much as we are investing in our ‘national security establishment.’ Sounds harmless enough. This national conversation as to the pros and cons of defence spending is well worth having, although I do feel a touch like we are closing the barn door after the horse has escaped. But perhaps it is not too late. Macdonald and the Rideau Institute did not issue a report that looks at the past decade as a dark memory while noting the positive changes in the future: the report was merely been released now to coincide with ten years since the attacks took place. The astronomical spending that Macdonald outlines continues to this day, and that should be the main take away from the report. 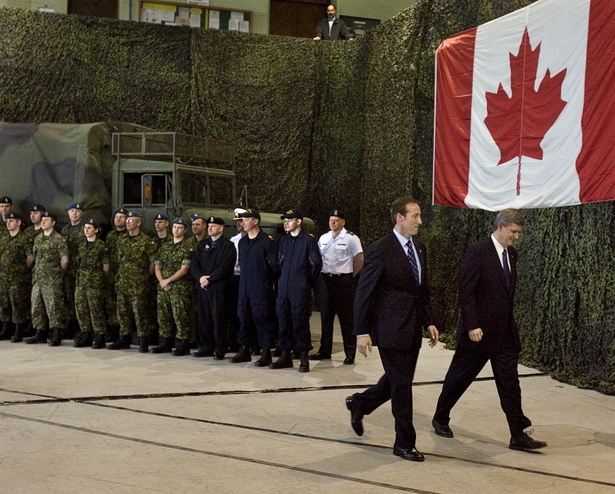 Not that spending on all Security and Public Safety Programs has jumped 186% in the decade since 9/11, but that Stephen Harper’s Conservatives continue this reckless level of defence spending to fight a largely abstract concept and a diminished ‘enemy’. That the upward trend is not a historical anomaly and footnote yet is what keeps me feeling unsafe. I don’t feel safer, but clearly some people feel substantially richer. It’s flagrant disaster capitalism. The security industry (in both Canada and the U.S) has milked the fear wrought by 9/11 for profit, just as the American financial sector exploited the financial crisis to execute a multi-trillion dollar heist. You’re right in drawing Orwellian parallels. We’re presented with empty, generalized terms, accompanied by flimsy justifications, and we accept them. I guess educating ourselves is the answer. Writing and talking about it–like this.